I generally hold it with the wisdom of Public Enemy: Don't Believe The Hype. So, when something (in this case a book) comes along which is the bestestest thing ever, the greatest invention since the Triangular Wheel (Once bump less per rotation! ), and something I absolutely urgently totally Must Read Now – I politely decline. Because it's a turn-off, because it's all too frequently not true, because I've been disappointed a few too many times, and because tomorrow there will be a different latest greatest hottest never to be surpassed thing anyway. So, when Ann Leckie's debut novel Ancillary Justice burst on the scene, winning heaps or praise and about every award going (and, from the noise you'd think also some yet to be invented), I watched all the frothing going on, and read something else. Still, the book was presented to me, with quieter, more insistent recommendations, so I relented and read it. Here is what I found. Ancillary Justice is the first book in a 'loosely connected' trilogy known as Imperial Radch. The 2nd book in the series, Ancillary Sword, came out in in 2014, is on this year's Hugo shortlist (and likely to win, due to Puppygate); and the final instalment (Ancillary Mercy) is scheduled for release in 2015. Ancillary Justice has won the BSFA, Hugo, Nebula, and Clarke Awards (I think there's more, but that's the main ones anyway). The titles in themselves make interesting and subtle points – within the Radch Imperium (a rather large portion of space, centrally controlled) the names Justice, Sword, and Mercy refer to military space ships – a Justice is a troop carrier, the other two are smaller battle ships. An Ancillary, though, is a member of the crew of a Justice, a soldier, normally taken prisoner during an Annexation (ie the Radch gobbling up another planet or solar system), who in most cases is put in storage for a few hundred years, and who, when resurrected and ambulatory, has none of his previous memories or personality anymore, but is controlled by the ship mind of the Justice, who functions as some kind of hive mind, with many pairs of eyes, hands, voices. Voting for the 2015 Hugo Awards, to be presented at this year's Worldcon, Sasquan, has started. Now, this year's Hugos have caused a bit of a stir, albeit one long in the making. There is much to be read about it on the Interwebs, but, in a nutshell - a group group of SF fans (shall we call them that) felt that 'their' kind of SF was being ignored, underrepresented at the Hugos, for which I have some sympathy (hey, the shortlists would look different if _I_ got to pick them, too). They called themselves Sad Puppies, and organised a voting slate of works they would have preferred to see on the shortlists. Now, this might be within the letter of the law (or the Hugo rules), but violates the spirit of the award and it's administration. But it got worse - a second, affiliated group, calling themselves Rabid Puppies, also issued a slate, which came to dominate the nominations and thus shortlists. Given that their political/ideological orientation is, in my opinion, beyond the pale (this is the "No women, no blacks, no gays" brigade) we all of a sudden have a misogynist, reactionary, racist dominated Hugo shortlist. And this I object to, and will thus vote tactically/politically. Should you have avoided any exposure to the above mess, and planned to vote by the strength of the works on offer only, then be aware - this is also a political vote, and potentially not for something you meant to vote for. Colin Pillinger, CBE, who died earlier this year, was a planetary scientist best known as the instigator behind the Beagle 2 Mars lander project, and a key figure behind the Philae Lander which was (is?) part of the current Rosetta mission to the comet Churyumov–Gerasimenko. Besides his scientific publications he has, including the one at hand, 3 further books to his name. It starts with a Preface by Colin, giving some background on the conception of the mission, how the name was chosen, and how the book came to be (essentially: there was an exhibition on the topic in the Maritime Museum in Greenwich, at which it was suggested that he collect the material and publish it). This is followed by a page of Acknowledgments - or rather not, as he essentially refuses to make any to avoid the risk of omitting and thus offending someone from the team… I guess that’s one way of dealing with this problem! 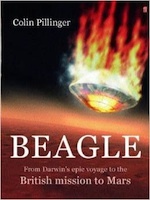 The next part of the book is titled On the Origin of Beagle. It expands a bit on the naming story, and introduces the first parallels to HMS Beagle and its famous voyage. Overall this feels like an abstract for the book (no surprise, given the academical background of the author), or a scene-setter. The album at hand, called Trees, Volume One: In Shadow is a collection of the first 8 issues of the on-going series Trees; written by Warren Ellis and illustrated by Jason Howard. Number 1 was published in spring 2014, number 8 in January 2015, with this collection hard on its heels. The setting is simple – this is a world which has been invaded by aliens, and has ever so slightly come apart at the seams as a result of that. Not completely, you see, as this is not your vanilla alien invasion, but out of whack with a slightly post-apocalyptic feel, nevertheless. Ten years after they landed. as if there were no-one here. Justina Robson is a British writer of Science Fiction like the magnificent Natural History, and of the less easily categorisable but hugely entertaining Quantum Gravity series (multi-dimensional urban magic police procedural - ?). Fantastic Fiction lists 10 novels and a collection of short stories under her name – this includes the book at hand, The Glorious Angels, where she attempts to walk the narrow line between SF and Fantasy. The story plays in the city of Glimshard – a former Sircene Mage City, but now part of the Golden Empire; ruled by an Empress (each of the 8 cities has one, they are mentally linked). Glimshard is at war, due to an expedition into the Southern Fragment, for what is called an 'Excavation'. The army is over-stretched, and the losses are huge and unsustainable. And the dig is in the Karoo forest – the Karoo being one of the decidedly non-human species on this world (although there is a huge amount of snobbery on what is considered human and what not - they definitely are not), and apparently a formidable enemy. I was not sure, for most of the book, what the reason for this was – why this was so important, worth that war, worth risking everything including the Empire. Are they really that desperate? Or that jaded? Or is this only the Empress' doing?